Frontdoorhomes is a Real Estate group of Northern Virginia Realtors that offers and specialize help with home search in all of Northern Virginia Real Estate properties. If you are looking for the best deals in Northern Virginia, whether it may be buying or selling homes, Frontdoorhomes Northern Virginia Realtors is going to be the right partner for you. Our Northern Virginia Realtors Search tool is the best and Easiest Search tool ever modified to bring customer satisfaction to the utmost level because it is very easy to use and reliable, check out our testimonials page from our satisfied clients and discover how FrontDoorHomes Northern Virginia Realtors can help you. Northern Virginia has been blessed with its proximity to the nation’s capital and the countless military and civilian jobs which help to fuel a robust economy and high standard of living. Many tech companies and government contracting enterprises have set up shop in this region especially because of the skilled and well educated workforce Northern Virginia offers. Local communities, such as Fairfax, lead the nation by example for its high standards and proven results for education, schools and teaching awards. Although the Northern Virginia region is largely urban - beyond the bustling suburbs are many towns that vividly retain a rural character and charm. The historic Towns of Manassas and Leesburg each offer unique flavors of a warm hospitality and friendliness rooting back to the Civil War & Colonial-era respectively. 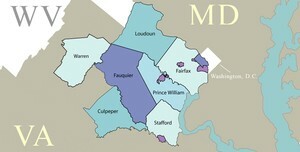 We specialize in helping military personnel, individuals and families relocating to Northern Virginia. If you are considering a move to this area we would be thrilled to provide you a Relocation Guide to Northern Virginia Real Estate.